Having fun, meeting new people and playing pool is what the APA is all about.. You don’t have to be a pool shark, because in the APA — everyone can play and anyone can win. 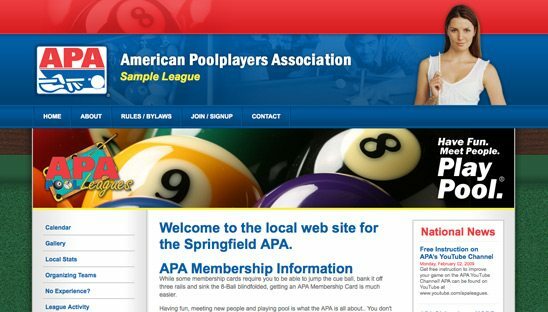 The APA wants beginners and novices, because it is the AMATEUR Poolplayers Association. No other organization in pool gives ordinary players a chance to win a share of nearly $1.5 MILLION guaranteed cash and prizes paid out through its national tournaments. This was our biggest job that we were hired to do by the APA. We were hired to design 1 main sample site for all franchise websites. By designing the core site using ASPX and a CMS, another company duplicated the site for 100’s of other franchise websites.